The player can find Tarkus in Sen's Fortress. His soul sign is located in the tower to the right when you are facing the Iron Golem's fog gate, with only the walkway as an entrance. Black Iron Tarkus is a powerful knight who aids the player in Sen's Fortress. Tarkus was the only one of the Berenike Knights to survive Sen's Fortress and reach Anor Londo. 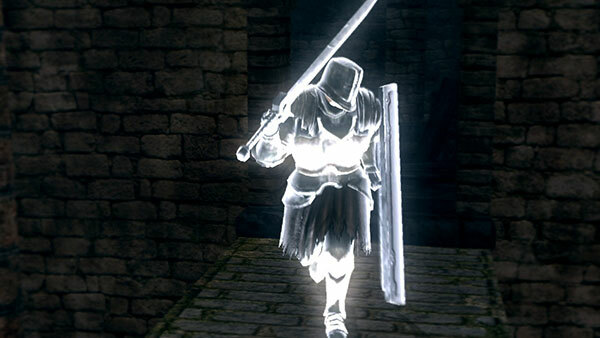 The player must be in human form for Tarkus' soul sign to appear. 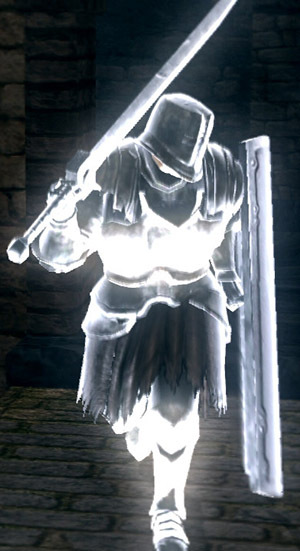 Black Iron Tarkus is a powerful ally and can easily distract the Iron Golem if the player wishes to fight from a distance. Tarkus can even kill the Iron Golem alone, especially on first playthrough. Be careful when leading Tarkus around Sen's Fortress if you don't take him immediately to the Iron Golem fog gate. If you take him below to help with the Heavy Knight, it's possible that he won't be able to make it back to help with the boss fight as he has trouble navigating the narrow pathways on the roof. If he continues to fall down while trying to follow you, eventually he'll die. A corpse, probably his, containing the Black Iron Set and the Black Iron Greatshield can be found near the large painting in Anor Londo. Tarkus means "wisdom" in Estonian. Black Iron Tarkus is likely a reference to the antagonist Knight Tarkus from the 1986 manga JoJo's Bizarre Adventure. Both Tarkuses are massive knights with enormous, seemingly unwieldy weapons and thick armor. The title "Black Iron" may also refer to Tarkus' companion, Black Knight Bruford. The way Black Iron Tarkus dies is also similar to how Tarkus from the manga falls off a cliff and into a barracks.